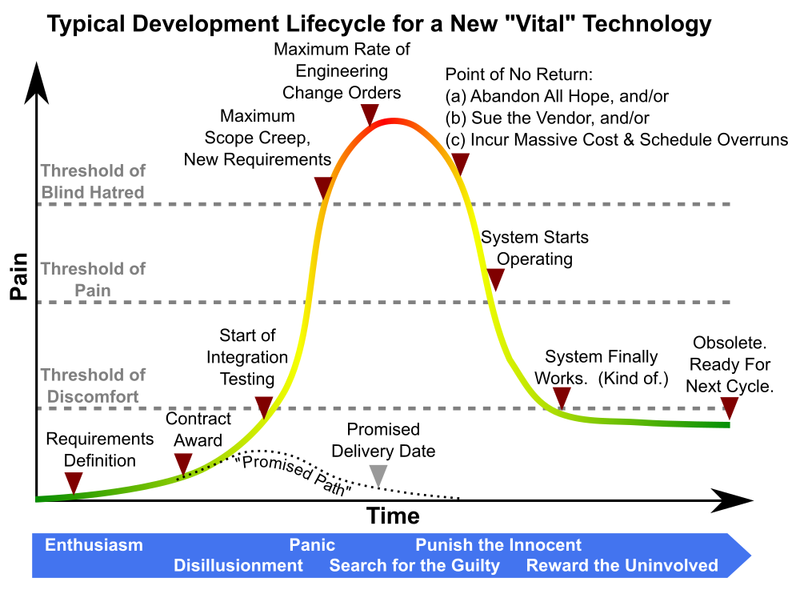 as anticipated in 2009 on this blog. Today we are at "point of no return." The deadly crash of an Amtrak train near Tacoma, Washington, which would likely have been prevented if a PTC (Positive Train Control) system had been in place, has renewed the discussion of the status of PTC systems in the Bay Area. Caltrain officials say everything will be OK with CBOSS, Caltrain's very own flavor of PTC. Despite those assurances, a potent brew of ingredients is mixing together. Bonfire of Lawsuits: After a well-chronicled program failure involving delays, cost overruns, and failure to meet milestones, Caltrain terminated the CBOSS prime contractor, Parsons Transportation Group, in February 2017. PTG and Caltrain promptly sued each other, with PTG claiming wrongful termination and Caltrain seeking up to $98 million in damages. A rich trove of documents can be accessed online under San Mateo Superior Court case number 17CIV00786, and chronicles in detail everything that went wrong with the CBOSS program. With Caltrain likely to recover some damages, PTG has now sued Alstom (formerly PTG's subcontractor and the supplier of CBOSS hardware and software) for failure to deliver a working solution. One is left to wonder how this motivates Alstom to finish the CBOSS project, since delivering a working solution to Caltrain would undermine the claim that Alstom was given an impossible task. Dying Product: The hardware and software underlying CBOSS is known as I-ITCS, a product originally developed by GE Transportation Systems Global Signalling. While a precursor known as ITCS briefly operated on Amtrak corridors in Illinois and Indiana, it is now being displaced by the de-facto standard freight PTC system known as I-ETMS, with ITCS relegated to controlling only the grade crossing functionality in these corridors. Alstom, which acquired GE Transportation Systems in 2015, is not likely to see a future in the I-ITCS product, leaving Caltrain with a globally unique hardware and software solution. This does not bode well for product support over the lifetime of CBOSS. Looming Deadline: the deadline imposed by Congress and the Federal Railroad Administration to successfully complete a PTC revenue service demonstration is just a year away, at the end of 2018. 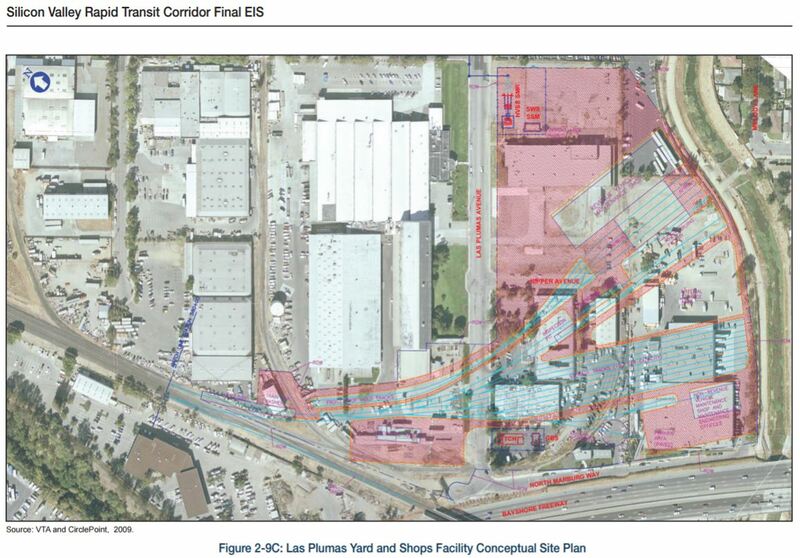 One year is not enough to finish, and Caltrain will almost certainly blow this deadline. Will FRA grant another extension and allow Caltrain to continue operating without PTC? Sole Source Savior: in July 2017, avionics firm Rockwell Collins' subsidiary ARINC was awarded a sole source contract to figure out what it will take to pick up the pieces and complete the CBOSS project. ARINC completed this assessment in September, and will soon (by sheer programmatic necessity, since failure is not an option) be awarded a name-their-price sole source contract to finish a minimally working version of CBOSS that passes FRA muster. With the leverage that ARINC enjoys under these circumstances, the "re-procurement" of CBOSS will likely be (1) expensive and (2) structured such that Caltrain bears all of the risk of continued failure, i.e. cost-plus-fixed-fee rather than fixed price. With the clock ticking, the re-procurement effort has already fallen behind the planned fall 2017 schedule. Budget Crunch: To date, Caltrain has spent over $200 million (yes, one fifth of a billion dollars!) on CBOSS with nothing to show for it. All the money allocated for CBOSS is spoken for, and a lot more (several tens of millions) will be needed to finish the project. Some of that will come from damages, but it is quite likely that 2018 will bring emergency financial maneuvers to throw more good money after bad. 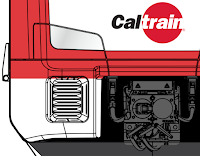 Descoping of Functionality: while the first 'I' in Caltrain's I-ITCS solution stands for "Interoperable," which was one of the original selling points of CBOSS, this feature is now being thrown over the transom. Interoperability requirements contributed to the scope creep that triggered a re-design of the supposedly off-the-shelf ITCS software. It didn't help that Union Pacific was (as per usual) actively non-cooperative in helping to develop an interoperable solution, leading to Caltrain throwing in the towel and spending an additional $21.7 million (from an FRA "interoperability grant," no less!) to dual-equip seven diesel consists with the I-ETMS freight PTC system for operating on the Gilroy branch owned by UPRR. How I-ETMS freight trains will be accommodated on the peninsula corridor in I-ITCS territory is a burning question, for which the range of answers includes ditching I-ITCS and replacing it with the more viable I-ETMS, following the Amtrak example. System Integration and Testing is Hard: while Caltrain never fails to remind us that all of the components of CBOSS are physically installed on the trains and the tracks, that is the easy part. The hard part is getting everything to operate together reliably every day, and Caltrain and their shifting band of contractors are barely getting started on this most difficult phase of the development of a new and complex safety-critical system. Integration and Testing is where the best design intentions meet cold harsh reality, and all the mistakes and omissions made during the design phase become painfully apparent. While PTG claimed in court filings that they were 90% done with CBOSS when their contract was abruptly terminated, that last 10% of troubleshooting commonly takes far more than 10% of the budget or schedule. PTC is Hard: the legal declarations from PTG managers who ran the CBOSS program (see 17CIV00786) reveal a long list of underlying factors that caused much acrimony and remain unchanged today: (1) the specifications and standards for PTC continue to evolve, triggering continued changes and penalty testing; (2) Caltrain and its in-house consultants (the so-called "owner's team") are woefully ill-equipped and uncoordinated in their approach to complex safety-critical avionics technology development; (3) the formal contractual interactions between the "owner's team" and the vendor are complicated and delay-prone; (4) working with UPRR is a huge pain in everyone's caboose; (5) the underlying systems over which CBOSS is supposed to "overlay" are kludged-together stove pipes that, incidentally, will require nearly total re-design for the electrification program; (6) testing PTC on an operating railroad requires extensive coordination that has been demonstrated to be lacking; and so on. Strike PTG and substitute ARINC. These ingredients will produce a situation where CBOSS does less than was promised, later than planned, and for a lot more money. No crystal ball is needed to predict that CBOSS will continue to "fail forward" to a finish line somewhere beyond 2018. If everyone drove instead of taking Caltrain, how many more lanes would peninsula freeways need to absorb the additional traffic? The way to answer this question is to count how many train passengers ride past any given location, in each direction, within the span of one hour. Caltrain publishes all the information you need to do this calculation rigorously, without making any assumptions: the timetable tells you when each train passes each location, and the 2016 weekday passenger count by train tells you how many people are on board that train at that time. Four cases are considered: morning northbound, evening northbound, morning southbound, and evening southbound. Rather than picking a fixed morning and evening hour over which to count passengers, we slide a one-hour window across the peak period until we find the peak hour at each location, during which the most passengers ride past. Caltrain operates five trains per hour per direction repeating on an hourly cadence, so we never count more than five trains in the totals. 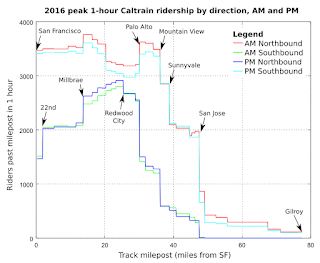 This graph reveals many of the features noted in ridership reports: the flow is asymmetrical with more riders traveling northbound AM / southbound PM, the Gilroy branch is dead, Stanford generates enormous ridership, etc. 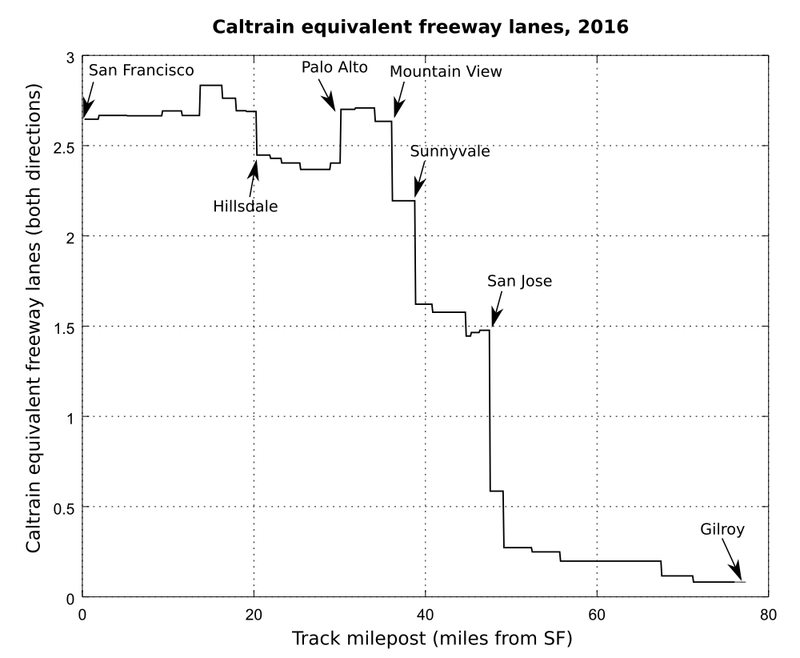 To convert the number of Caltrain passengers into freeway lanes, very few assumptions are needed, and those we need can be backed up by references. A congested freeway lane operating at 45 mph can carry 2000 passenger cars per hour, according to the Federal Highway Administration's HPMS Field Manual (Parameter values: FFS = 45 mph, BaseCap = 2150 pcphpl, PHF = 0.95, fHV = 0.98, fp = 1.0). The average vehicle occupancy (AVO) is 1.3 people, based on two studies of the 101 corridor in San Mateo County. This figure includes buses, van pools and corporate shuttles. This means a single freeway lane can theoretically carry 2600 people in one hour. Note this is a very optimistic figure because slight perturbations in the flow of traffic can cause slow-downs that reduce throughput due to lower free flow speed (FFS). But we'll use this very high number to make an extremely conservative estimate of how many lanes of freeway can carry all of Caltrain's ridership. 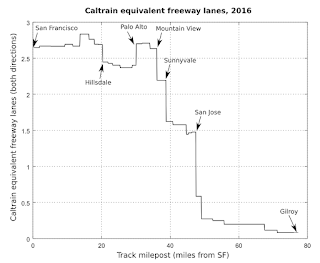 So as of 2016, plain old diesel Caltrain equals about 2.5 lanes of freeway, including both directions. 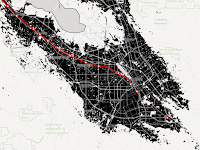 If you integrate the area under this curve, you get how many lane-miles of freeway would be needed to replace Caltrain. That number is 119 lane-miles. These are very conservative lower bounds. When you hear the argument that "millions" of people use highway 101 but only about 30,000 people use Caltrain, shut it down with facts: today Caltrain amounts to 2.5 / 8 or at least 30% of the lane capacity of highway 101 during rush hour. The reply might be that not all those people would end up on 101, but with an average trip length of 23 miles, which driver wouldn't use a freeway? Caltrain capacity is set to increase considerably, first by ~30% with the initial electrification and modernization project, and by ~60% once the system is running at 6 trains per hour with 8 cars each. (If you don't count standees, those figures are ~10% and ~25%, but why would you not count standees?) A 60% capacity increase is equivalent to one and a half lanes added to the entire length of highway 101 from San Jose to San Francisco. It doesn't have to stop there: more trains per hour and longer trains are possible, because EMU trains scale up in a way that diesel can't. A future Caltrain capacity increase to about 10,000 passengers per peak hour per direction (about triple today's throughput) isn't out of the question, does not require adding tracks or expanding the rail corridor, and would equate to adding 5 new freeway lanes. In certain quarters of Silicon Valley that are enamored of Hyperloops, self-driving Teslas and Boring underground tunnels, electric Caltrain is looked down upon as a last-century technology that is about to be made obsolete. That particular outlook fails to grasp the importance of throughput or to recognize the enormous carrying capacity of modern electric rail. Self-driving Teslas and Hyperloops will achieve dismal throughput capacity as measured in passengers per hour, and no amount of whiz-bang technology will change the underlying geometry of this increasingly urban region. The way forward is to add more freeway lanes of Caltrain. 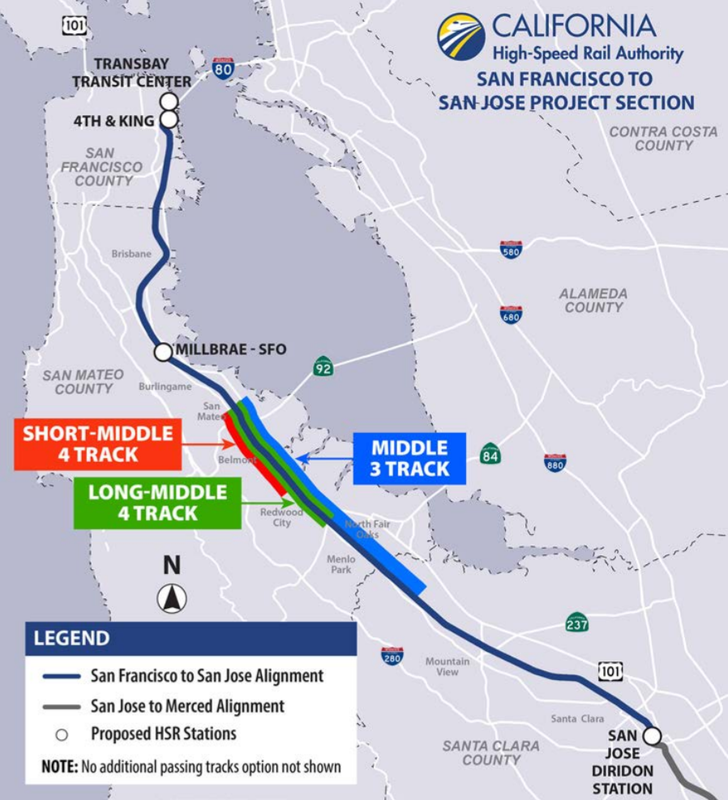 In its renewed environmental review process for the San Francisco to San Jose project, the high-speed rail authority is considering the alternatives for the peninsula rail corridor. 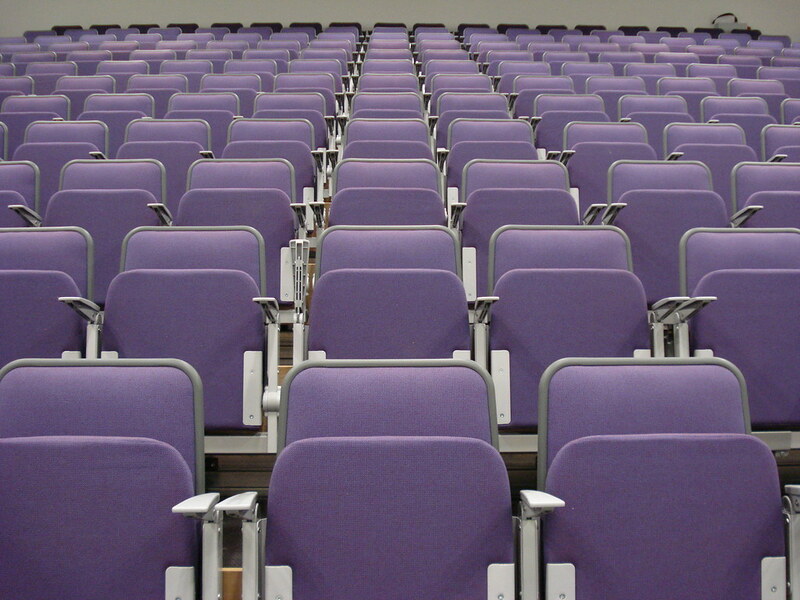 The outlines of the new draft EIR are emerging, and this is where politics meets engineering. 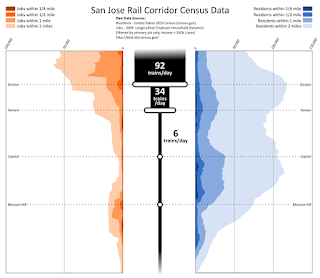 Interested stakeholders keep asking about how the blended system will actually work, with Caltrain and high-speed rail sharing the scarce resource that is track capacity. 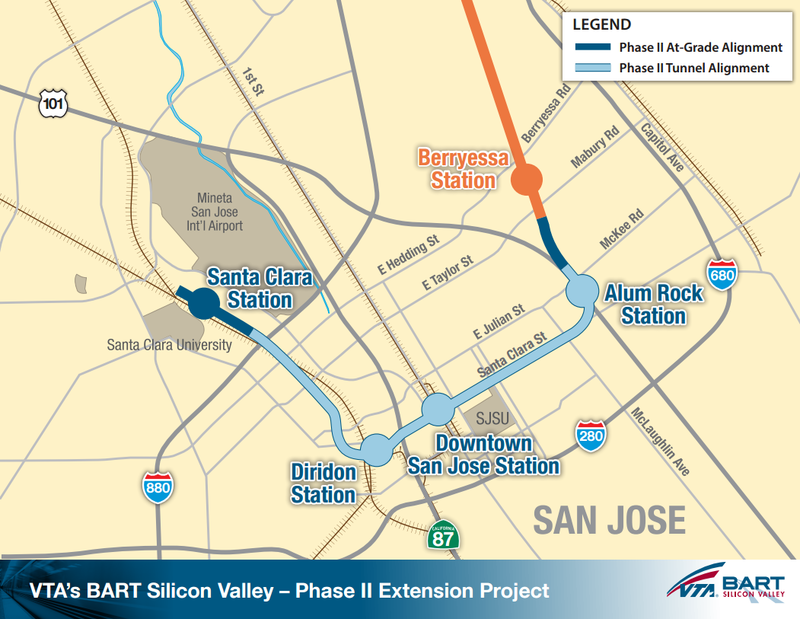 The issue is being studied in some detail behind closed doors by an entity known as the Joint Scheduling Working Group (JSWG), consisting of experts from HSR and Caltrain aided by their respective consultants. As of the end of 2016, the JSWG had produced a first report on its work, which was shaken loose by a public records request from CARRD. Before digging into this, let's take a look back at how we got here. With speeds limited to 79 mph, the most reasonable option with 6 Caltrain + 4 HSR was a "short middle overtake" between Hayward Park (San Mateo) and Whipple Ave (Redwood City). A "long middle overtake" all the way through Redwood City provided only marginal performance improvements. This study legitimized the blended system, which has ever since been the favored approach to bringing HSR to the peninsula rail corridor. The study contained numerous disclaimers to the effect that no official decisions had been made regarding future service levels, programmed overtakes, stopping patterns or scheduled trip times... all the important considerations that feed into a railroad's product, namely its timetable. Unlike the 2012 study, the "long middle overtake" performed significantly better than the "short middle overtake." 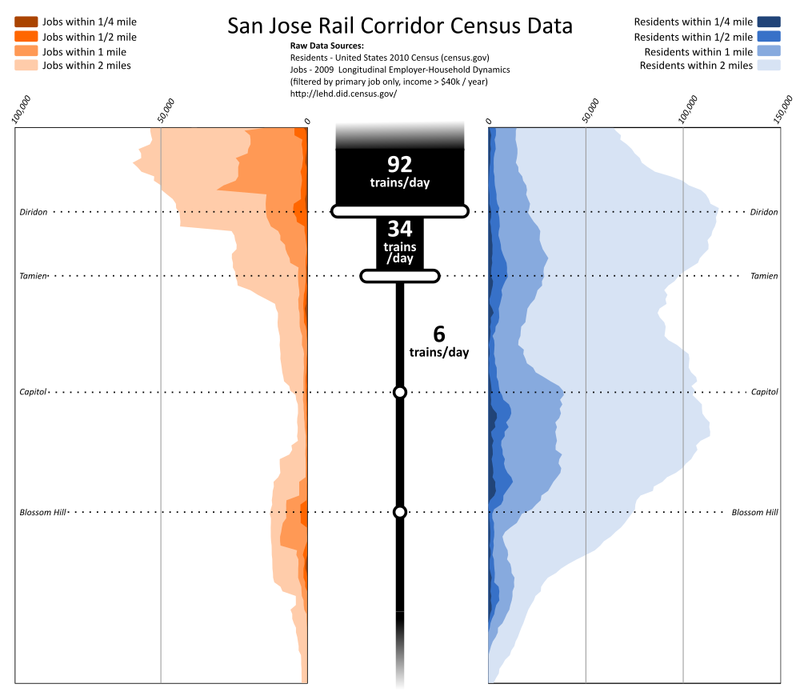 A new option, the "middle 3-track overtake" (between San Mateo and Palo Alto) performed almost as well in simulation, although it assumed all HSR trains entered the corridor on time, unlikely in practice. Other overtake track options did not fare as well. The disclaimers continued, with the conclusions of the study being described as "educational." 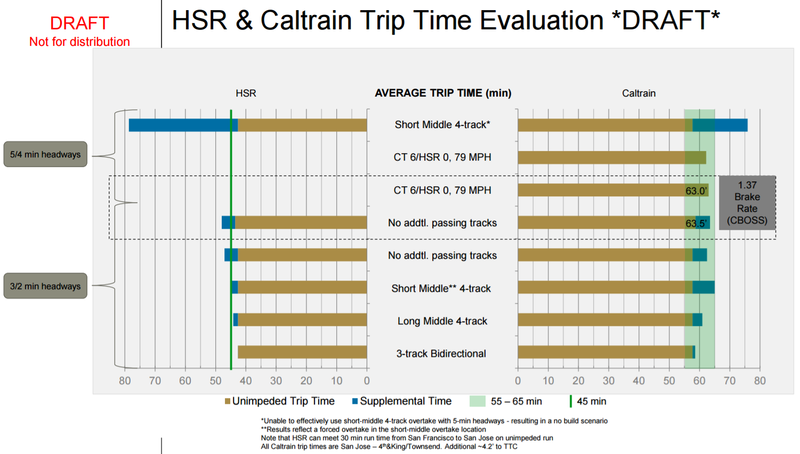 The "no additional passing tracks" case is shown to support 6 Caltrain + 4 HSR per hour per direction, unlike in the LTK studies, provided that headways are tightened and Caltrain passengers don't mind sitting in a siding for 6 or 7 minutes during these overtakes. The "short middle 4-track overtake" degrades Caltrain trip times, since overtakes don't naturally tend to occur there. The "middle 3-track overtake" performs better than any other option, thanks to allowing bidirectional operation through almost its entire length, unlike in the LTK study where half the length of the overtake track was dedicated to each direction. The HSR team really, really doesn't want to build the "short middle 4-track overtake," generally because they have no money and specifically because the SMA analysis has shown this scenario to be a poor performer operationally. However, the HSR team is reluctant to withdraw any alternative this late in the preparation of an EIR, after it was carefully introduced to the public through countless outreach meetings, workshops and open houses. Sudden change scares people. 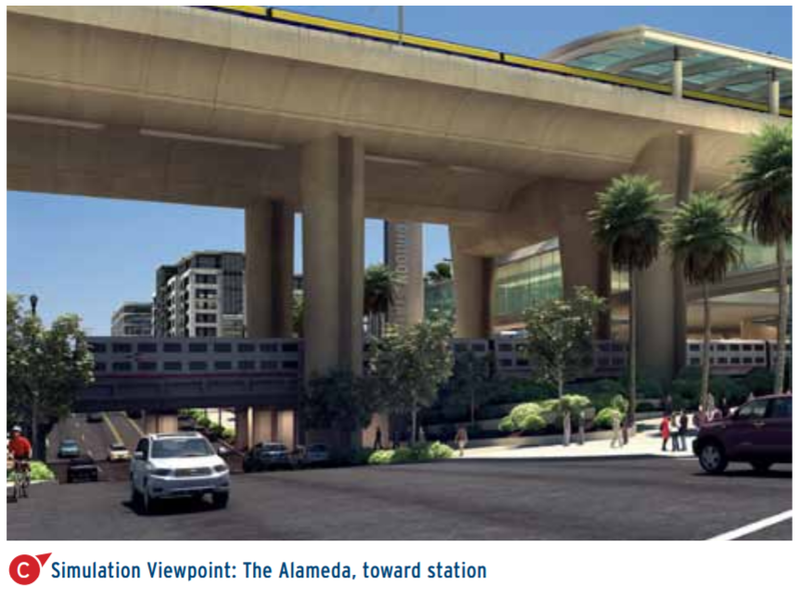 In order not to build the "short middle 4-track overtake," the HSR team has engineered it into a straw man alternative, using the prospect of grotesquely massive concrete viaducts towering fifty feet over San Carlos and Belmont to strategically elicit vigorous public opposition. It's working, but unbeknownst to them, San Carlos and Belmont have little to worry about. Due to having no money, the HSR team strongly favors the "no additional passing tracks" alternative. 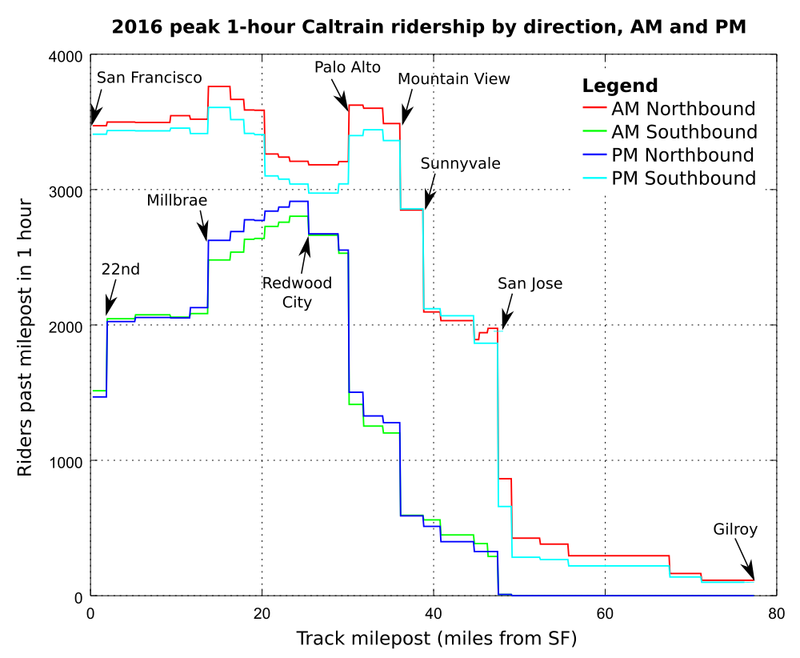 The mediocrity of the resulting Caltrain timetable, and the amount of time spent by Caltrain passengers waiting to be overtaken, is of little concern to them. But that's okay, since San Carlos and Belmont made them do it. The HSR team probably dreads resistance from Caltrain stakeholders who don't want the peninsula rail corridor being taken over to Caltrain's detriment. Strong resistance could force the HSR team to revive the "middle three-track" alternative that had previously been eliminated from the EIR process (see slide 15 in this outreach presentation), setting back the environmental review schedule. If the assumptions in the SMA analysis stand up to closer scrutiny, the "middle three-track" scenario could actually be a viable compromise for the blended system. 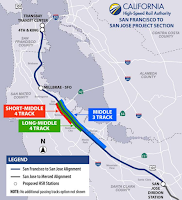 It would no doubt be expensive due to the number of new grade separations, but the result (if one believes SMA) would be fast and robust service for both HSR and Caltrain, with reasonably-sized grade separations in every town from San Mateo to Palo Alto. In the last year, the winds of public opinion have turned more favorable to grade separations in Menlo Park and Palo Alto. One thing is sure: the "middle three-track" alternative should be added to the HSR EIR and studied in detail, with an eye towards designing the future blended system timetable. The timetable is the product, and it will soon be time to decide on one. Shorter trains off-peak reduce maintenance costs by putting less wear and tear on the vehicles and track. The same revenue train-miles can be offered with fewer car-miles. The more off-peak service is provided, the greater the savings: at 3 trains per hour, operating 4-car EMUs instead of full-length 8-car EMUs off-peak results in a huge reduction of 25% fewer weekday car-miles. Just how big are the savings? Typical commuter rail costs are available from the FTA's National Transit Database. The operating and vehicle maintenance costs for Caltrain and selected commuter rail operators are shown at right for the year 2015, normalized by the total number of car-miles operated. Some on this list (Metro North, LIRR, SEPTA and New Jersey Transit) operate sizable fleets of EMUs, but their maintenance costs are not significantly out-of-family with Caltrain; therefore, it's fair to assume that maintenance costs will not materially change after electrification. Since the FTA maintenance totals are not broken out by fixed and variable costs, we will conservatively assume that the variable cost (which scales directly with the number of car-miles operated) accounts for half of the vehicle maintenance cost. Squinting at the chart, let's estimate this variable cost at $2 per car-mile. When you operate 12 hours of off-peak service at 300 train-miles per hour, the variable cost of vehicle maintenance racks up at 12 hours/day * 300 train-miles / hour * 8 cars/train * $2/car-mile = $58k/day. 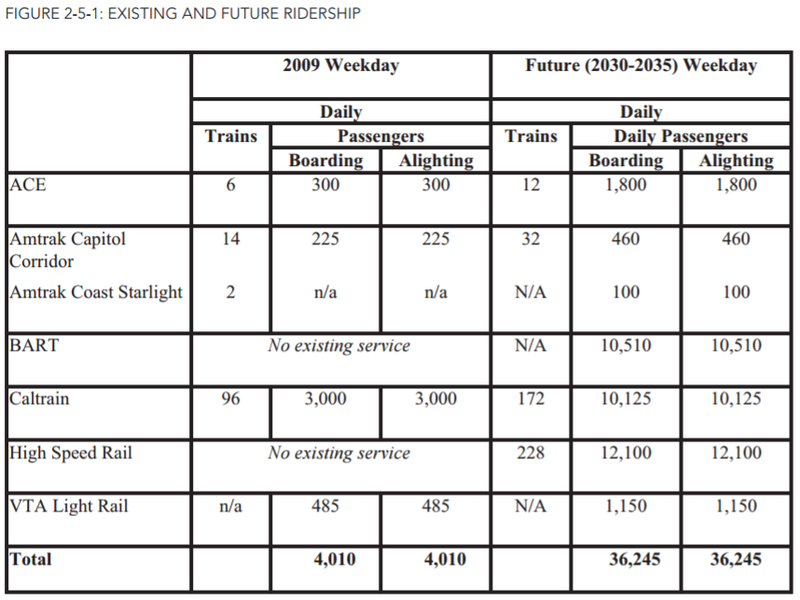 By reducing off-peak train length to 4 cars/train, the savings are half of this, or $29k/day. The savings from shorter trains accrue not just on weekdays but on weekends too, yielding annual savings of roughly $10 million. Then you might want to factor in energy cost savings. Each car weighs about 60 tons loaded, and is accelerated to about 60 mph between two typical stops. The electricity consumed to accelerate is re-generated into the grid while braking for the next stop, with a round-trip efficiency likely in the neighborhood of 80%. That means overcoming the inertia of one car for one stop (neglecting drag) takes 4 MJ of electricity, or 1.2 kWh in more familiar units. At typical electricity rates of 12 cents/kWh, that's just $0.14/car/stop. Multiplying it up, $0.14/car/stop * 20 stops * 3 trains/hour/direction * 2 directions * 12 hours/day * 8 cars/train = $1600/day. (Note that drag will significantly increase this figure, but can be neglected for this estimate because the drag of a 4-car train is similar to that of an 8-car train.) By reducing off-peak train length to 4 cars/train, the savings are $800/day. At less than $300k per year, this is just a rounding error compared to the vehicle maintenance, and can be ignored. Offsetting these savings are the costs of making and breaking train formations several times per day, since the entire fleet needs to be available for morning and evening peak service with full length 8-car EMUs. Traditionally, this is a cumbersome operation that involves expensive and specialized labor, with ground crews stepping onto the tracks to connect pneumatic hoses and high-voltage cables. 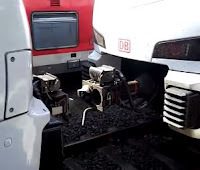 Caltrain is breaking with tradition by using a neat technological trick: the couplers on each end of the new EMUs are fully automatic Schakus, making mechanical, pneumatic and electrical connections in a matter of seconds at the touch of a button in the train cab. Barring any union rules relating to craft distinctions, making and breaking trains can be performed by train crews with zero additional labor cost. Labor accounts for about two thirds of operating costs in typical commuter rail systems. Operating costs are strongly driven by train crew size. Minimum crew size is constrained by union rules that govern how many conductors must work on each train. Currently, the minimum crew size (dictated by Rule 11 of the agreement with the UTU) is 1 engineer, 1 conductor and 1 assistant conductor for trains up to seven cars, with a second assistant conductor required for an 8-car train or longer. When contemplating a tripling of off-peak service, the cost of this minimum staffing level becomes prohibitive. Conductors are paid about $40/hour, and assistant conductors about $35/hour. Including benefits and other employee costs, the overall cost of these employees is easily double these figures. Additionally, conductors typically spend about half their shift time on board a revenue-producing train, so the necessary staffing levels are roughly double the number of trains in service. We saw earlier that it takes a fleet of 12 trains to operate off-peak service at 3 trains per hour per direction; staffing an assistant conductor on these trains would cost $70/hour/conductor * 1 conductor/train * 2 hours/(revenue hour) * 12 trains * 12 (revenue hours)/day = $20k/day. Again this is big money: the savings from removing the assistant conductor and going to one-conductor operation accrue not just on off-peak weekdays but on weekends too, yielding annual savings of roughly $7 million. How do you sell this lower staffing level to the union? EMUs can relieve conductors of some of their workload, after automation of many of their traditional roles (such as stop announcements, door and lift operation, or signal aspect acknowledgement). Fare verification (proof of payment) could even become a separate role carried out by roving fare inspectors. 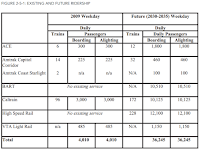 Conductor staffing levels or pay rates can be renegotiated on the basis of actual ridership, instead of the number of train cars, since the new EMUs will have automatic passenger counters that collect detailed and accurate passenger ridership statistics. Most importantly, the total amount of work for UTU-represented employees would increase, since one-conductor operation would enable a tripling of off-peak service, resulting in 1.5 times more labor hours even after cutting conductors staffing levels in half. It isn't a stretch to envision Caltrain and the UTU re-negotiating the labor agreement to allow just one conductor on four-car off-peak trains; there is room for a compromise that can benefit everyone. 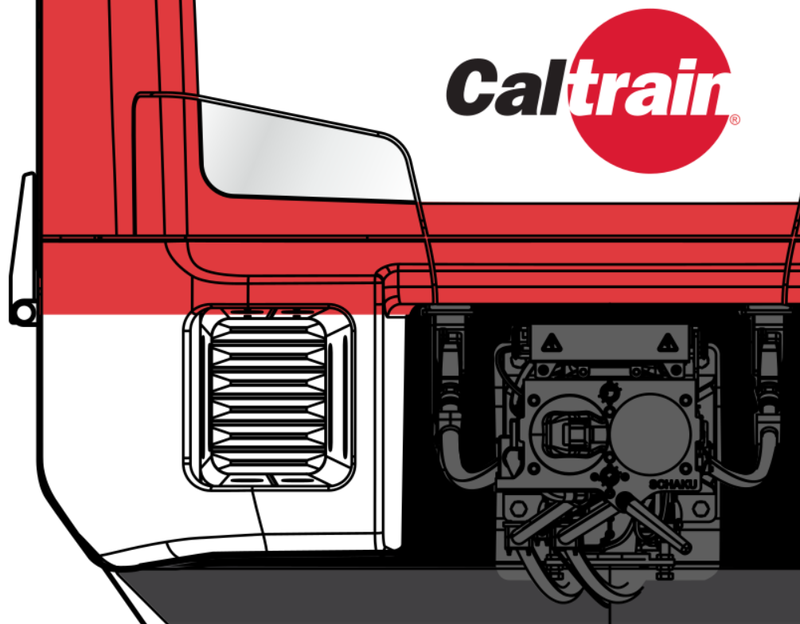 Caltrain's initial fleet of sixteen six-car EMUs (total 96 cars) will not have the ability to split into shorter formations, but once the option for 96 additional cars (total 192 cars) is exercised, and all trains are extended to their intended length of eight cars, the practice becomes not only possible, but necessary for providing frequent off-peak service. 16 4-car EMUs for off-peak service, each with one bike car and one bathroom car, that can be coupled in pairs during peak hour service to form eight trains with eight cars each. This EMU fleet configuration enables 20-minute off-peak service frequency for at least $17 million/year cheaper operating and maintenance cost than would otherwise be achieved with a uniform fleet of all 8-car trains. 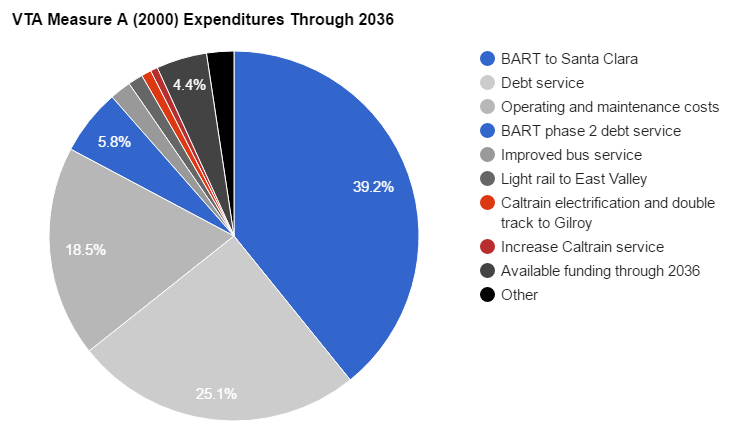 That's a large amount, easily over 10% of Caltrain's current annual operating budget. Considering that Caltrain struggles every year to scrape together enough operating funds, a stronger way of stating it is that without 4-car EMUs and one-conductor train crews, Caltrain will simply not have the financial means to provide 20-minute off-peak service frequency. This being Silicon Valley, future plans for Caltrain modernization are known as CalMod 2.0, the next big thing beyond the CalMod 1.0 improvements that are already under contract. In the grand scheme of things, these aren't outrageous expenses ("only" another 38% over and above the $2B tab for CalMod 1.0), but they're not cheap, either. To meet capacity challenges in the short term, possibly concurrently with delivery of CalMod 1.0, perhaps some of these expenses can be moved up to realize the maximum bang for the buck as soon as 2021. The EMU fleet for CalMod 1.0 consists of sixteen 6-car trains, with a reduced seating capacity of 558 that has caused much yammering amid the increasing load factors during peak commute hours. Even without a ridership bump from the "new and modern" effect, it is likely these trains will be packed from day one. Now is the time to start doing something about it. Two unpowered cars would seat up to 264 passengers. 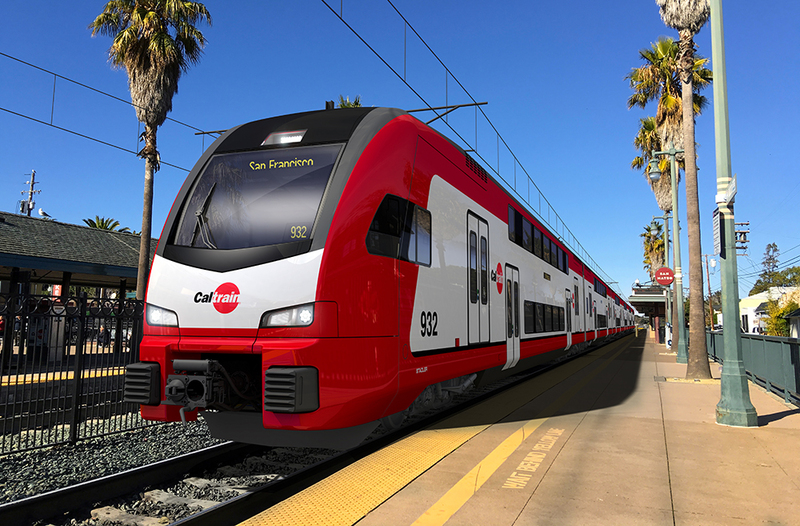 The contract with Stadler includes an option for another 96 cars priced at $390M, a figure larded up to $440M in the CalMod 2.0 total presumably due to the usual procurement overheads. This figure is for 100% fleet replacement, with all the remaining diesel consists being retired. In the short term, only 1/3rd of the option cars would need to be exercised; this involves purchasing 32 cars or 2 extra cars for each of the sixteen EMU consists in the CalMod 1.0 order. The per-train capacity will increase by well over 200 seats per train, back to a level that will mitigate peak hour crowding. However, 8-car EMUs will exceed the length of many of the existing platforms. Platform extensions are relatively cheap to build, especially when you don't need to rebuild the entire length of station platforms as would be needed for level boarding. You can leave vertical circulation (stairs, ramps) and amenities (vending machines, lighting, benches, PA system, departure boards, etc.) alone and just tack on a short length of concrete, and perhaps move a pedestrian crossing. 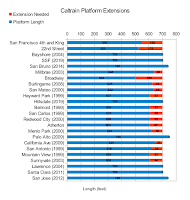 Caltrain excels at building platforms and has done so extensively, pouring some 5 linear miles of platforms over the last 18 years! 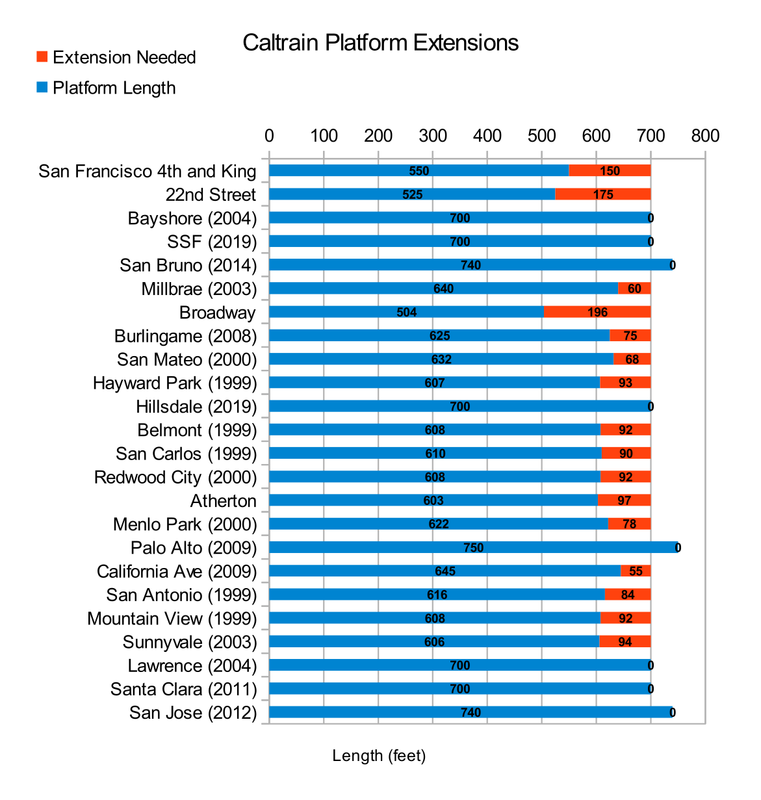 The length of Caltrain's existing platforms is documented in this schematic of California rail systems. To dock an 8-car EMU, platforms need to be extended to at least 700 feet. The necessary extension lengths are graphed at right; labels show the year of completion of each platform's construction. The total amount of platform extension required to operate 8-car EMUs is approximately 3500 feet. This figure excludes Hillsdale and South San Francisco, both of which are already slated to be rebuilt to 700 feet. Each foot of platform costs about $7000 to build, on the basis of a typical $10M cost for two 700-foot platforms from past platform reconstruction projects. Therefore, the tab for extending all platforms to 700 feet (for the time being, at their current height of 8 inches) lies in the range of $25M. The bottom line: another $175M or an extra 9% investment over CalMod 1.0 yields an extra 23% peak hour seated capacity for CalMod 1.1. 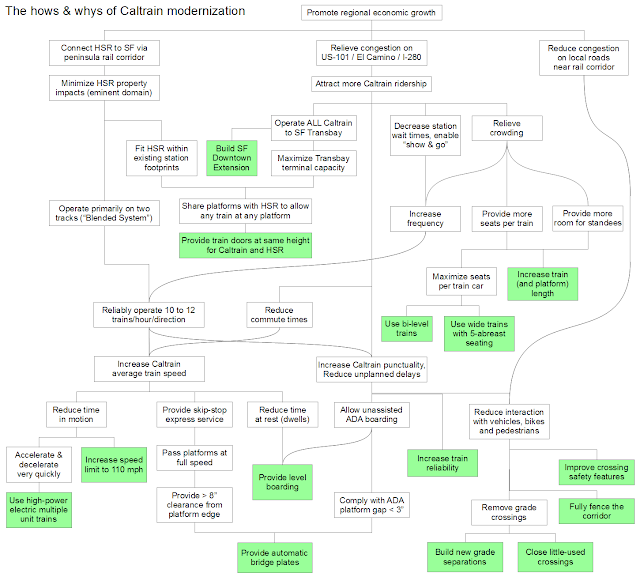 It would be best to start planning for CalMod 1.1 now, and to turn CalMod 2.0 into the big level boarding project for the 2020s. In software parlance, the CalMod 1.1 patch should be applied immediately upon release of CalMod 1.0. With the delay of a federal grant long planned for Caltrain modernization, there is fear and uncertainty on the peninsula rail corridor. Everything about the project is being put back into question by voices on all sides of the issue. In times like these, it helps to step back and look at the big picture. The big picture has not changed since 2008, and there is a logical flow to it that remains true regardless of the funding situation. A requirement flow diagram shows a hierarchy of requirements, things that are needed or wanted, and how they relate to each other. The way to read it is to follow along the connectors between boxes. When reading downward, the next box down answers HOW the previous box is to be achieved. 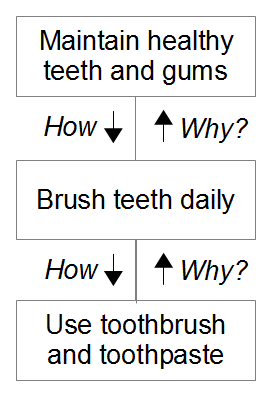 When reading upward, the next box up answers WHY the next box is necessary. A simple and intuitive example is provided at right. Next, we move on to a more complicated diagram that represents the blended system in general, including the Caltrain modernization project. The derived attributes at the ends of the requirement tree are highlighted in green. If you delete any of the green boxes, all of the boxes that depend on it above are negatively affected. For example, if you delete level boarding, then you can't reduce station dwell times, which means you can't increase Caltrain average speeds enough to allow operating peak hour traffic, which in turn means the blended system won't work well, and HSR may need to build four tracks all the way. For another example, if you delete train doors that work at the same height as HSR, then Caltrain can't share platforms with HSR, which means bigger stations and limited capacity at SF Transbay, so Caltrain won't be able to run all trains into the downtown core, which in turn will hurt Caltrain ridership and increase congestion on highway 101 and I-280. This is a useful way to think about the problem, and reveals three important ideas: (1) the mere lack of funding won't make the problem change or go away, (2) the technical approach pursued by Caltrain is sound, if only partially effective, and (3) hacking away the entire HSR side of the diagram doesn't fundamentally change the solution ultimately needed for Caltrain modernization. 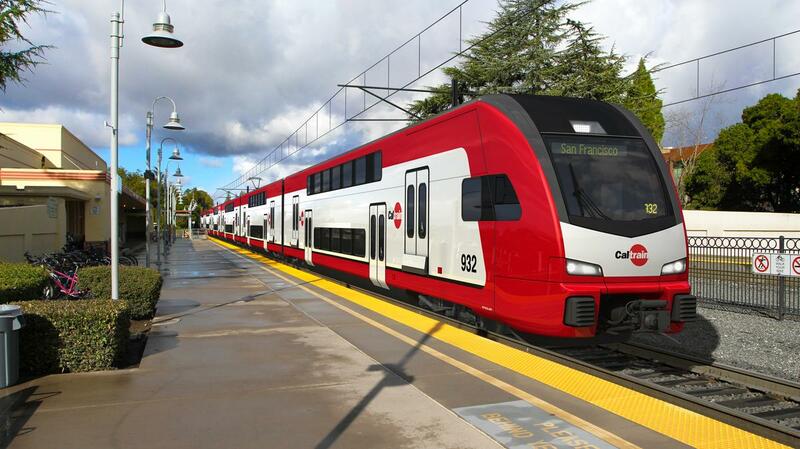 As Trump's FTA ponders whether to award a big chunk of federal money to make Caltrain great again, the agency itself is failing to promote in pictures what its modern fleet will look like. Visit caltrain.com or even the nascent but unadvertised calmodtrains.com, and you won't see any images of the new Stadler EMUs. We know they exist, and now might be a good time to splash them all over social media. Note the train now sports folding bridge plates on the high doors. To be fair, Caltrain is really good at snark.